Front brakes typically don't last as long as rear brake because they take most of the job of stopping the car. Depending on driving habits and the design of the car front brake should last between 20,000 and 35,000 miles. If you were to have the brake job done that include new pads and rotors at a repair garage it would typically cost between $245.00 and $430.00 US currency in most cases excluding exotic cars. You can get pads and rotors for about $110.00 to $140.00 US at Amazon or pay a little more at the parts store. Hybrid and electric cars will go much longer on a set of brakes because the electric motor does most of the stopping to recharge the batteries. The brake pads, rotors and calipers are a normal wear item on all cars and responsible for slowing and stopping the car once it is in motion. If these items are neglected it can cause serious implications when applying your car's brakes due to the lack of brake material (metal on metal). 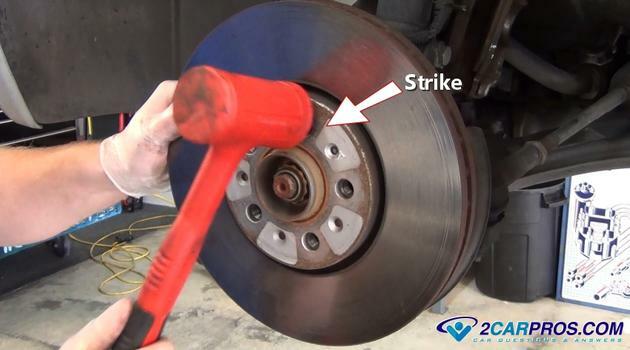 An indication for brake replacement is a squeaking or grinding noise when you hit the brakes. Also a chirping sound when the vehicle is rolling without the brakes being applied or a brake system warning light on which indicates the brake fluid is low. Low brake fluid is an indication of needing brake pads because the fluid displaces the missing pad material in the calipers. Here is the video of the job getting done. After watching please continue down through the guide to gain additional information which is updated regularly. This guide includes both front wheel and rear wheel drive vehicles which use a bearing hub or old style serviceable wheel bearing set ups. Only remove one caliper and complete the brake replacement on one side at a time. Identity Brake Components: A disc brake system consists of a brake rotor, caliper, caliper mount and an inner and outer pad set which is held inside of the caliper (wheel removed). 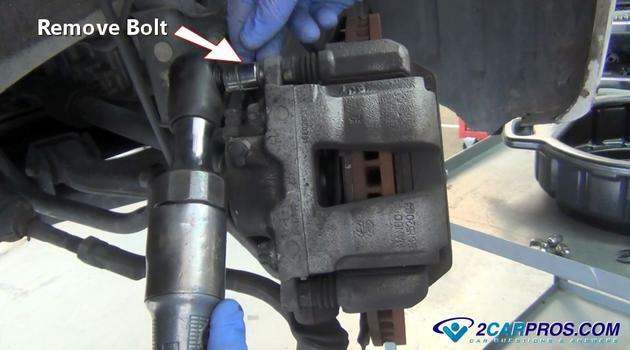 Reset the Brake Caliper: With the ignition key in the unlock position grasp the caliper and turn it outward to gain access to the mounting bolts. 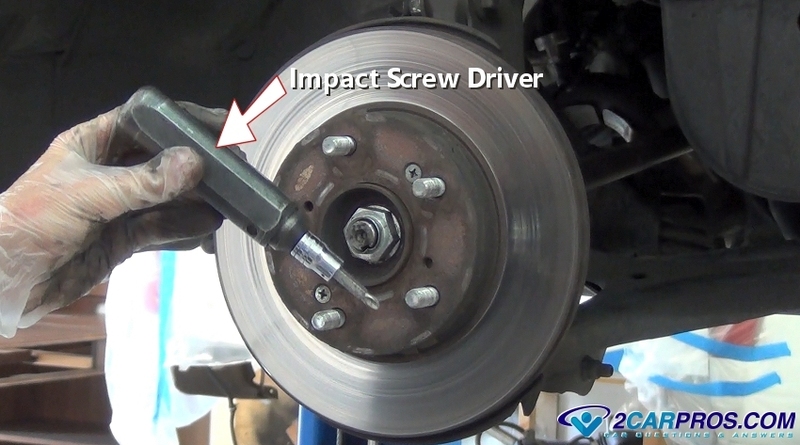 Then locate the brake caliper bleeder screw which is toward the top and remove the dust cap. 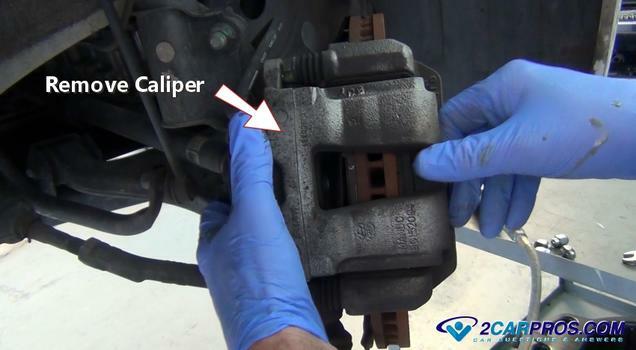 The fluid that is in the caliper could be contaminated and may contain small dirt, metal or rust particles. When pushing the piston back into the caliper this contaminated fluid can cause problems for the ABS valve, motor and master cylinder which can cause these components to fail. 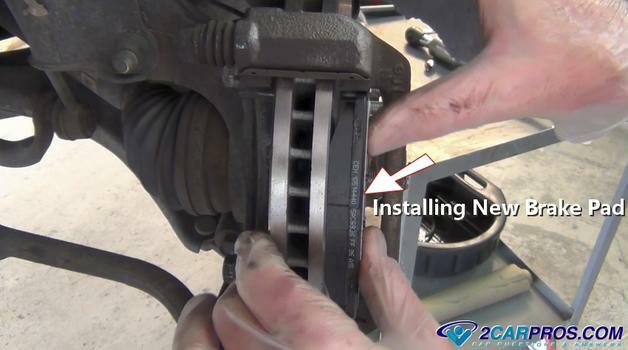 This step is to allow the brake fluid that has entered the brake caliper in place of the worn brake pads to be removed. Use a small wrench in most cases an 10mm and fit it over the bleeder valve. Next attach a piece of rubber tubing or hose over the bleeder valve while the other end of the hose is sitting in a fluid container. Push the wrench counterclockwise to open the valve (rubber tube optional). Once the bleeder is open use a small pry bar or large flat blade (standard) screw driver to wedge it between the rotor and old brake pad. Then start applying pressure back and forth to widen the gap while pushing the piston back into the caliper. Fluid will start to flow from the tube and into the container. 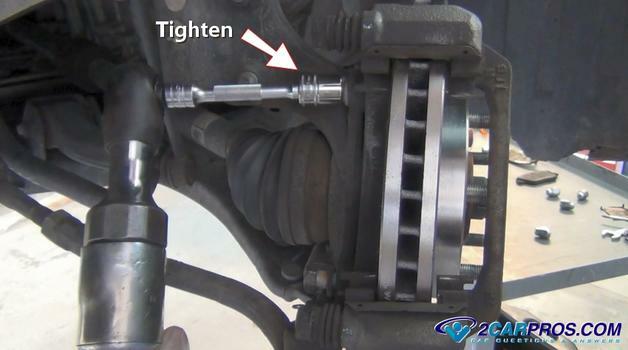 Continue this operation until you cannot push the piston any further back into the caliper. 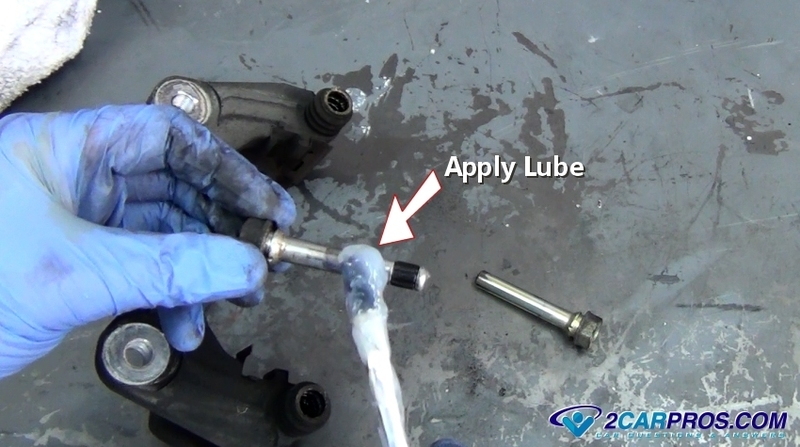 While holding pressure on the piston close the bleeder valve then remove the hose and wrench. On some calipers is it difficult to reset the caliper in the fashion so this step will need to be done after the caliper has been removed using a large C clamp or channel locks. If channel locks are used install an old pad to help protect the caliper piston. 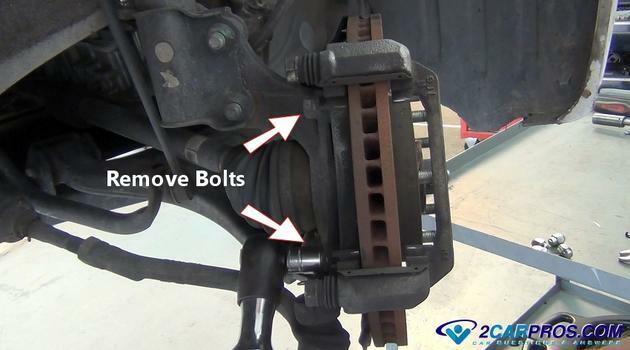 Remove the Brake Caliper: Locate the caliper mounting or slide bolts on the inside of the caliper. The bolt head sizes can either be 14mm, 15mm, 18mm, 8mm or 10mm hex drive, or a 35 torx bit in most cases. (Some Volkswagen's use their own special 12mm or 14mm ten point torx to keep you from doing the brakes with normal tools, you must have this special tool to the job) Use a ratchet or wrench to loosen and remove both bolts by turning them counterclockwise. You might need an additional wrench to hold the caliper slide from turning but this is not typical. Once removed inspect the condition of the threads and replace them if worn. Now the caliper will be loose. 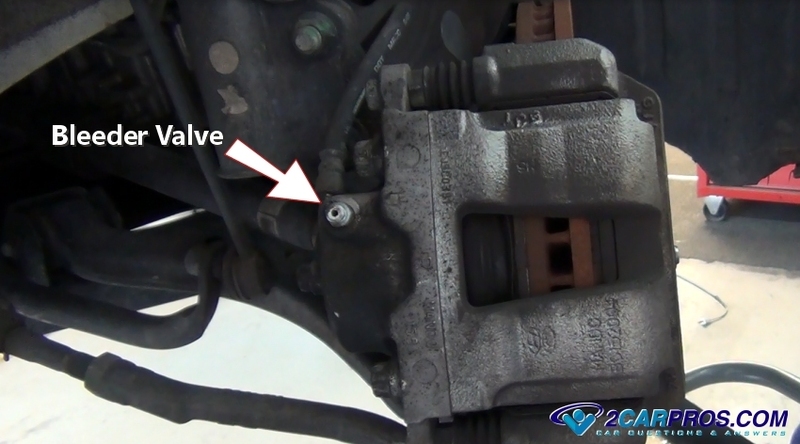 Grasp it to remove the caliper from the brake pads and the caliper mounting bracket. 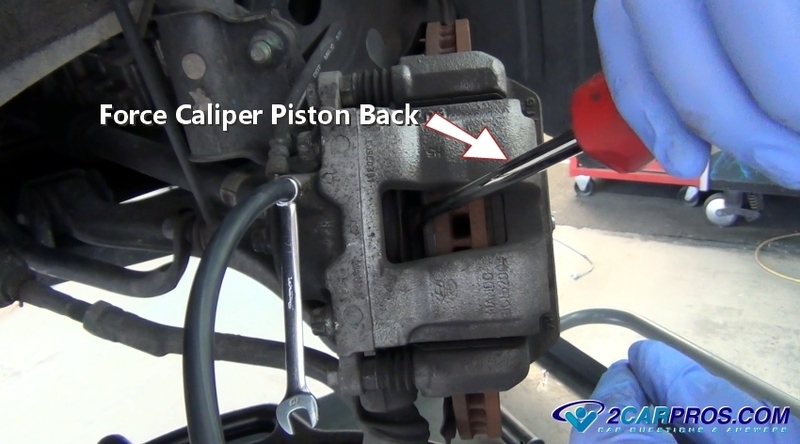 If the caliper has not been retracted you may need to rock the caliper back and forth a little to remove it. Once the caliper is free from the pads set it securely on the lower control arm, strut bulk head or use a zip tie to hold it out of the way. Be careful not to bend, kink or allow the caliper to hang from the brake flex hose. 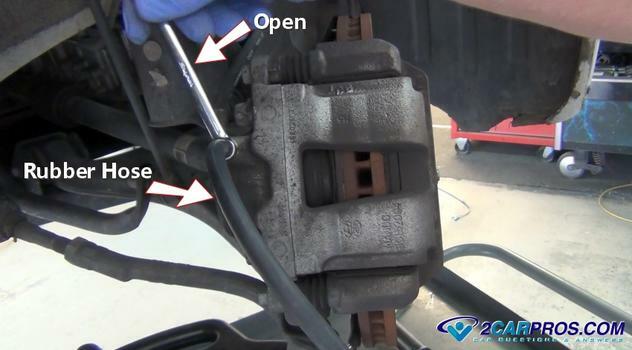 Thoroughly inspect brake caliper and brake hose for leakage, cracks or chaffing and replace it if needed. 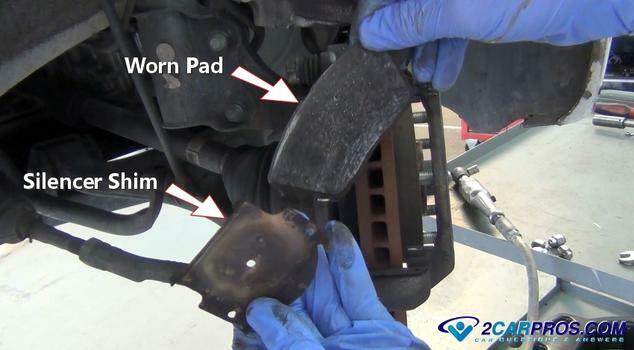 Remove the Brake Pads: Once the brake caliper has been removed grasp the inner and outer pads and slide them outward from the rotor and out of the caliper mounting bracket. You can use a standard screw driver and wedge it between the pads and the rotor to help in the removal. Sometimes the pads will get stuck on the caliper upon removal which you can then pop them out from the caliper to remove. Inspect the worn pad and silencer shim. Look for uneven wear which is an indication of a seized caliper slide which will need to be serviced. We will show you how to do this later on in this guide. 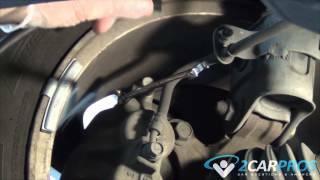 Remove the Caliper Mounting Bracket: The caliper mounting bracket must be removed to replace the brake rotor in most cases. Locate the mounting bolts on the inner part of the bracket. The bolt head size will be larger than the caliper mounting bolts such as 17mm, 18mm or 19mm in most cases. These bolts can be held in with thread lock so make sure the socket or wrench is on securely before applying pressure counterclockwise to remove them. When removing the last bolt the mounting bracket will become loose so keep your hand on it so it doesn't fall. 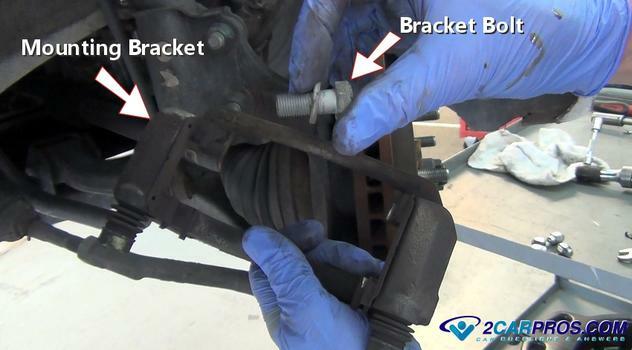 This bracket will contain the caliper slides which will need to be removed and cleaned before reassembly. 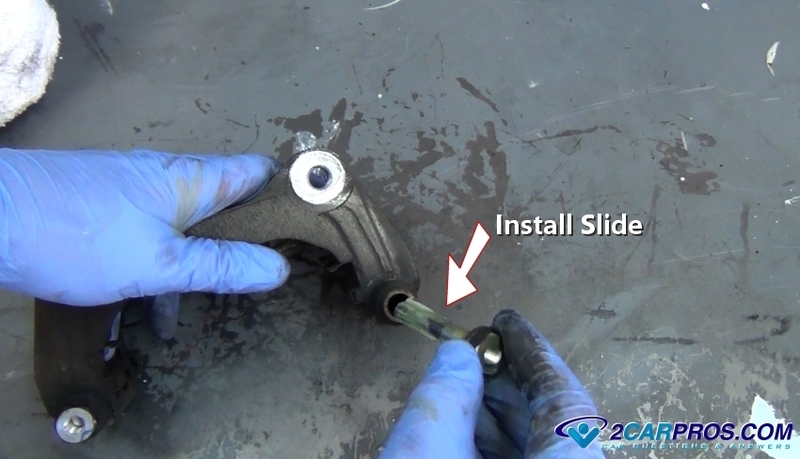 These slides help the caliper float to ensure that both inner and outer brake pads wear evenly. Now the brake rotor is ready to be removed. 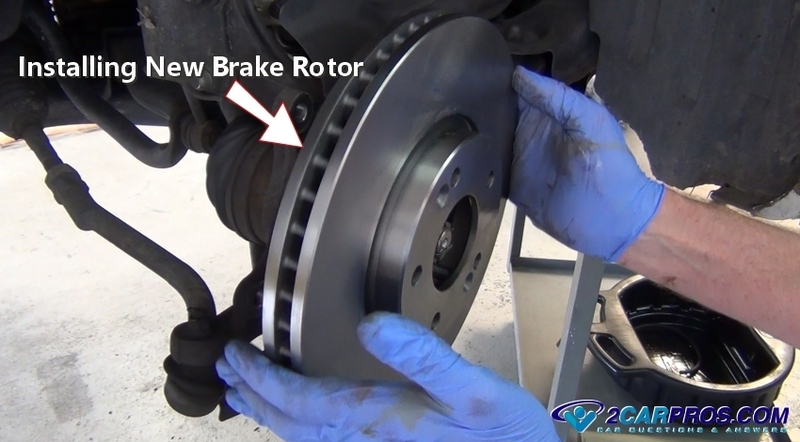 A brake rotor is designed to utilize brake pressure provided by the brake system to stop the car. This brake rotor utilizes friction and heat to convert momentum into stopping power. Brake pads ride against either side of the brake rotor and are held in place by the brake caliper. Brake rotors can either be solid or ventilated depending on the application design. Replacement costs for brake rotors have come way down in recent years and replacing them has become the preferred method over resurfacing. There is a minimum thickness measurement requirement designed to uphold rotor performance integrity. Once a rotor reached this minimum measurement it must be discarded or it can warp causing the steering wheel to shake when the brakes are applied. A brake rotor is only capable of holding a specific amount of heat. 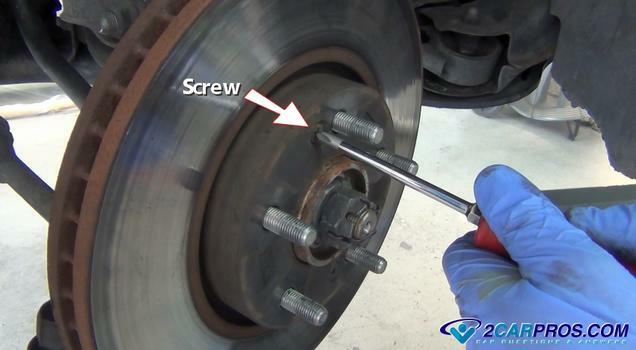 Once this level is reached the brake rotor cannot hold additional heat causing the brakes to fade. 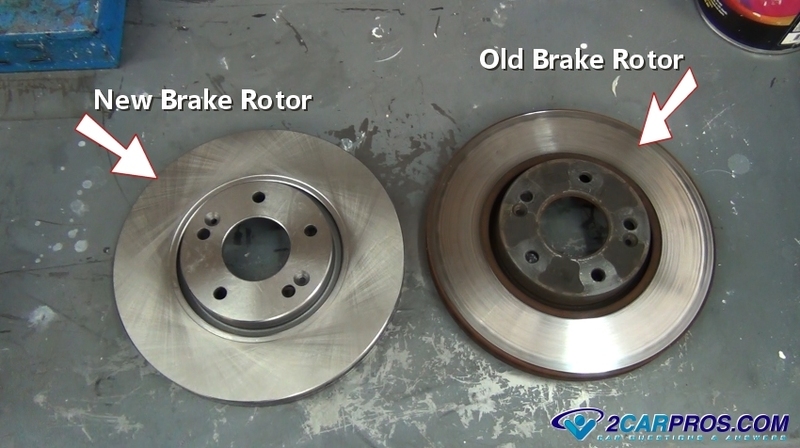 Brake fade is a condition that will hinder the brake performance until the brake rotor has cooled. If a brake rotor is subjected to prolonged overheating conditions it can destroy the rotor by crystallizing the rotor's metal causing hot spots which will create a grumbling sound when the brakes are used. 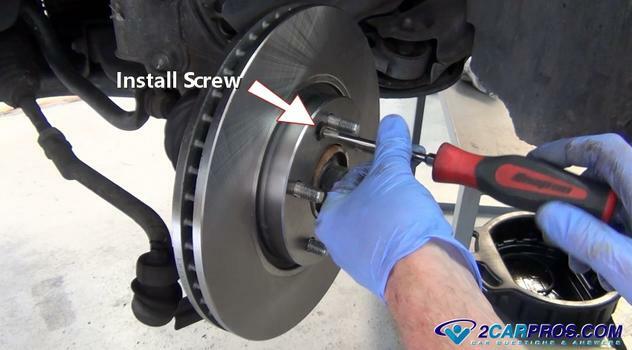 A brake rotor's surface can become uneven and have groves in it as the brake pads wear which is a natural occurrence. New brake pads are perfectly flat and need a flat surface to mate against. If new brake pads are installed onto a worn brake rotor it can cause weak brake operation and squeaking. This can cause the brake pedal or steering wheel to pulse when the brakes are applied. It's not a good idea to install new brake pads on an old brake rotor because the braking surface will be uneven and will diminish the brakes ability which can make the car pull one way or the other when braking. This is known as "slap pads on it" and is the very cheapest way to do a front bake job. Replace the Brake Rotor: Some brake rotors are held to the bearing hub with a mounting screw or sheet metal clip on the wheel stud. Use a screwdriver or impact screwdriver to remove the screws. There also may be sheet metal clips that can be removed with a pair of side cutters (dikes). These clips can then be discarded. These mounting screws can be on there pretty tight in which case you must use an impact screwdriver which looks like this and is available from Amazon or you can rent it from the parts store which is pretty cheap. While wearing safety goggles use a hammer and strike the end of the impact screwdriver which will unlock the screw and make it more easily removed. The impact screwdriver has two settings, tighten and loosen so make sure you have it on the correct setting. After removing any mounting screws or clips the rotor should be loose. Sometimes the rotor can be stuck due to rust and the fact the wheel is tightened against it and the bearing hub. While still wearing safety goggles use a plastic or regular hammer to shock the rotor loose for removal. This can take some force so don't be afraid to give it a good strong strike of a metal hammer. Once the old brake rotor has been removed match it to the new rotor. Check the outer diameter and mounting offset along with the wheel stud location, they should be an identical match. Some people like to re-machine rotors using a brake lathe. We recommend new ones because the re-machined rotors will have less metal to dissipate heat with which can make them warp. This condition will make the steering wheel shake when applying the brakes. 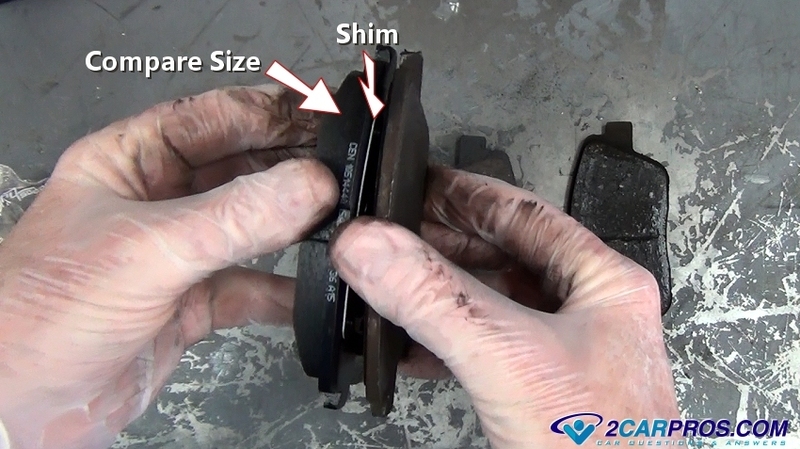 Use a shop towel and wipe off the mounting surface of the bearing hub and make sure it's free from dirt and grease. This will allow the new rotor to sit squarely on the bearing hub. Once the old rotor has been matched to the new unit, align the wheel studs and rotor mounting screws. Then slip the rotor onto the bearing hub. Install the rotor mounting screws and tighten. You do not need to use the impact screwdriver to make the screws super tight at this point because the rotor will be held on by the wheel and lug nuts. On older cars and light trucks the rotor will house the axle bearings and grease seal which will need to be cleaned and repacked (serviced). The caliper sides are designed to allow the caliper to float while being bolted to the mounting bracket which helps the brake pads wear evenly. 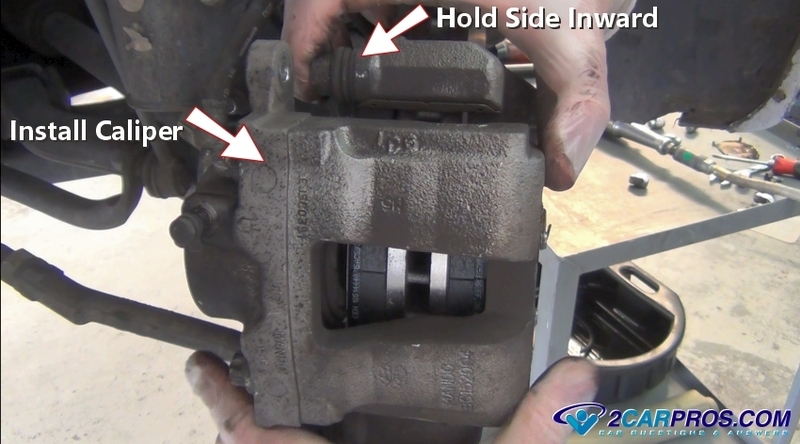 When brake caliper slides become stuck due to rust and corrosion the car can pull while braking which causing one pad to wear excessively compared to the opposite pad in the caliper. It can also cause the brakes not to release once applied and create excessive heat. Remove the Slide Bolts: Grasp the slides and pull them outward while twisting this will help break the dust boot seal loose. Continue to work the slides outward until they come free from the mounting bracket. If a slide is stuck or seized in the bracket use a vise to hold the bracket and a pair of pliers to work it loose by moving it back and forth while applying WD40 and pulling them outward. Use a shop towel carburetor or brake cleaner and a wire brush to clean all rust and corrosion from the slides. 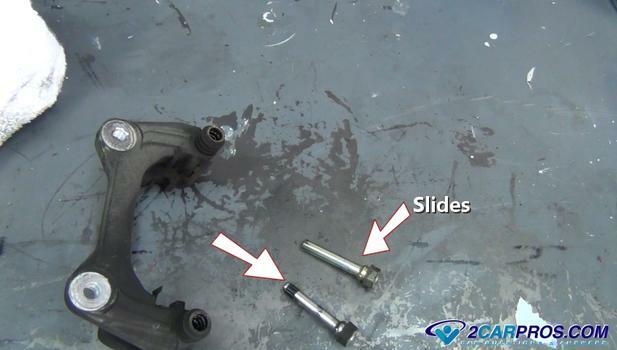 Check the slide bolts for wear and replacement them if excessive wear is observed. Once the slides have been cleaned apply a thin layer of silicone brake lube to both slides. Some slides will have a dampener on one end be sure to not get these mixed up. Install them back into the hole they came out of. Reinstall the Slides and Caliper Mount: Install the caliper slides into the caliper mounting bracket with a twisting motion and make sure the slides move easily in the out. If not, remove the slide for more investigation. These slides can become worn and have groves in them in which case they will need to be replaced. Slide pin grooves can cause the caliper to hang which will create uneven pad wear and braking characteristics. Before reinstalling the caliper mounting bracket clean the threads of the bolts by using a small wire brush. Then hand thread in both mounting bolts into the bracket. Tighten the bolts evenly to manufacturer's specifications which is usually between 70 and 90 foot pounds. A small amount of thread lock can be used to ensure the bolts do not come loose. 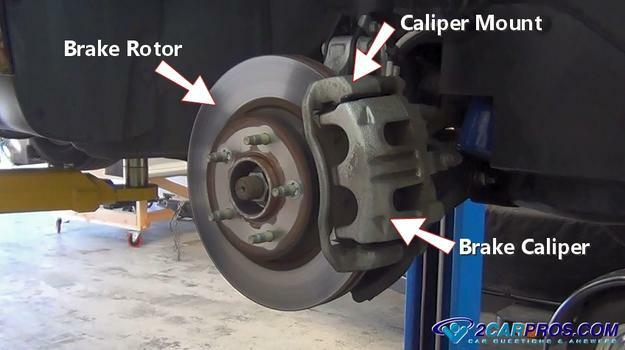 Once the caliper has been removed and the rotor replaced you are ready to install the new brake pads. How Do Brakes Pads Work? Brake pads are designed to absorb heat as they create friction against the brake rotor when the brake pedal is activated. These pads ride against either side of the rotor which are held in place by the brake caliper which is typically mounted to the spindle or backing plate. Hydraulic pressure is provided by the brake system via a brake master cylinder. When the brake system is activated the brake pads are forced against the brake rotor causing it to slow down the motion of the car. Brake pad backing plates are made of metal and there are several different classifications of the brake pad composites for example; organic, semi metallic and ceramic to name a few. The organic pad is used mainly for stock applications. The semi metallic is used for trucks and SUV's while the ceramic pad is used for extended life applications. Each of these pads possess individual wear and usage characteristics for example; organic pads are the most forgiving pad when it comes to brake rotor wear and tend to make less brake noise such as squeaking. Semi metallic pads tend to be more abusive to the rotors but can take more heat then organic pads before brake fade occurs. 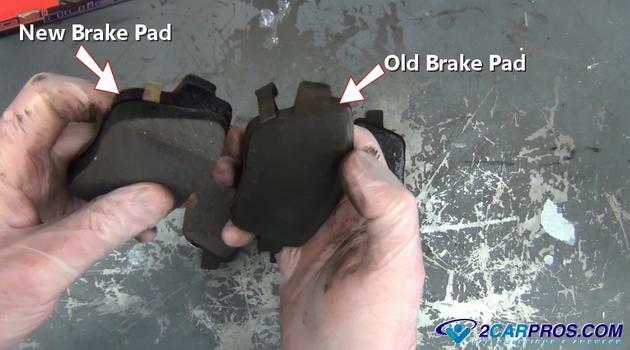 Ceramic pads are the hardest pad of the group and can wear out the rotors over the life of the brake pad. 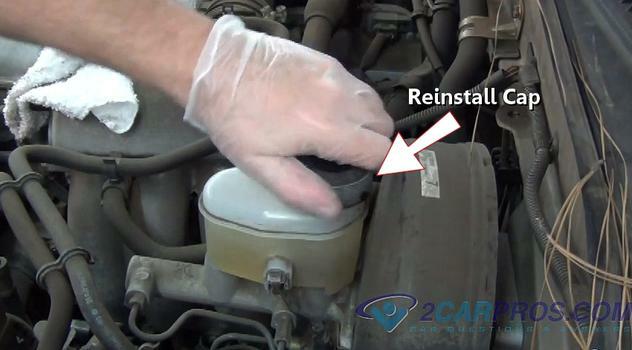 Ceramic pads can also be associated with brake noises such as squeaking and grumbling. The advantage of the ceramic pads is the lifespan of the brake pad set is about 20% longer than a regular brake pad. Every brake pad manufacturer has their own mixture of composite material that can vary in cost and quality. This material is bonded or riveted to the pad's metal backing plate. 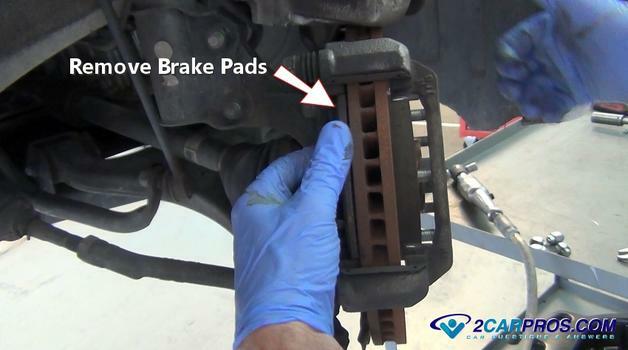 Install the Pads: When replacing the brakes always match the old brake pads to the new brake pads. 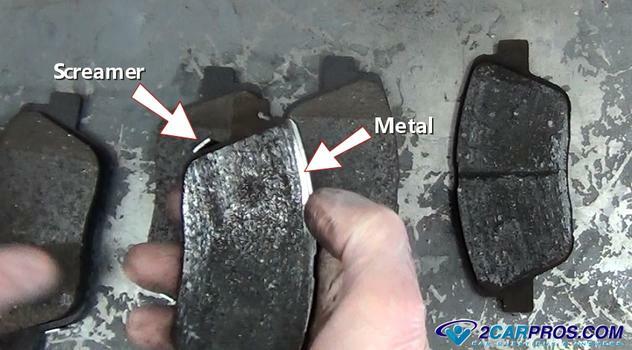 The backing plate of the brake pad should be identical to the old except for the missing composite material. Some pads are fitted with anti rattle clips. 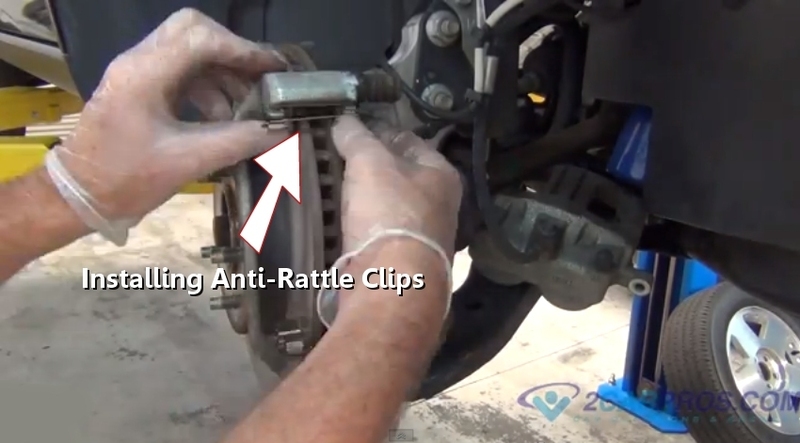 These clips are design to allow the pads to move freely within the caliper mount. If these clips are not included with the brake pad set transfer the old clips to the new brake pad set. Do not discard the anti rattle clips this will result in the pad having excessive clearance which will create a popping or clicking sound when the brakes are applied. Some brake pad designs will include a screamer style of wear indicator. This minimum thickness indicator was created to make a chirping or screaming noise when the brakes are in the idle position or when the brakes are applied. In an effort to help keep the brake pad in place car manufacturers have designed built in outer clips that hold the pad to the inside and outside of the caliper. The inboard pad clip fits inside the caliper piston while the outboard pad clip attaches to the outer part of the caliper. These clips hold the brake pads into the brake caliper. In the example below you can see the pad screamer which is what creates the squeaking or chirping noise when your brakes are getting low. This safety device is to warn you the brakes need replacing. At the upper side of the pad you can see metal which coins the phrase "my brake are metal to metal" meaning the backing plate of the pad which is made of metal is contacting the rotor which is also metal. When brakes are in this condition the stopping power is greatly compromised. Compare the old pad to the new one and pay special attention to the size of the pad's backing plate tang. These tangs are what hold the pad in place. 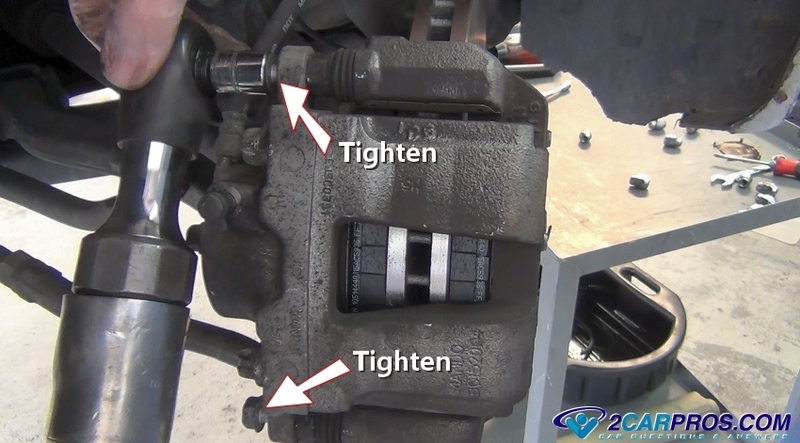 If the tang is too large it will not fit into the caliper mounting plate and if the tang is too small the pad will rattle and click when driving or stopping. Also the screamer warning tab needs to be in the same place as the old pad when installed back into the mounting bracket. Match the old pad backing plate size to the new pad. Some new pads have an anti-squeak vibration shim already attached to the rear of the backing plate so no additional measures to stop brake squeak is needed before installation. In older application an anti-squeak spray or coating was used but usually had little to no effect on stopping brake noise. 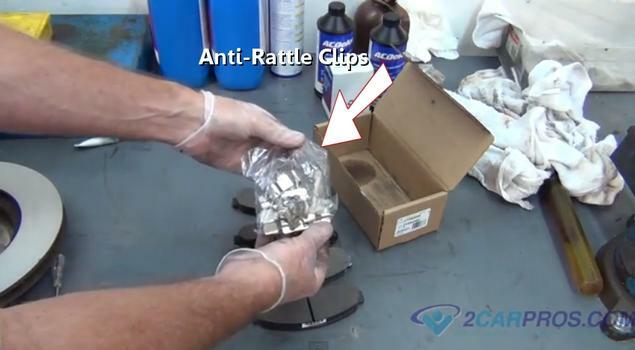 In some applications new an anti-rattle clip sets are supplied with the pads. 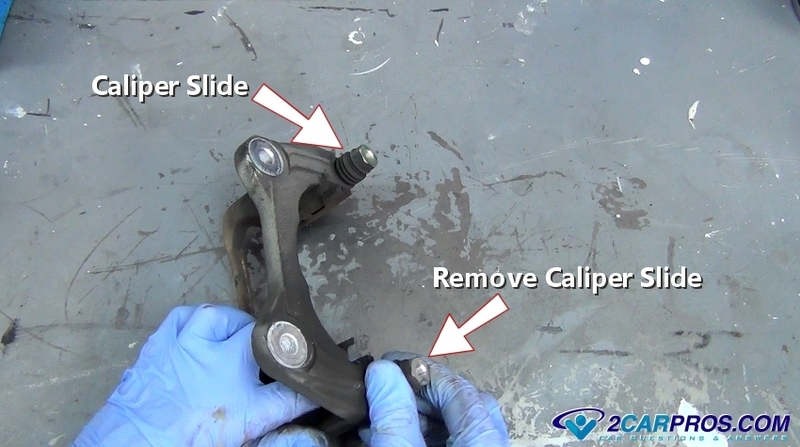 Remove the old retainer clips and install the new ones onto the caliper mounting bracket. When installing pad anti-rattle clips into the caliper mounting bracket make sure the orientation of the clips are correct. Install the new pads one at a time. Push down on the spring retainer clip and nose the top of the pad inward to rest it squarely against the rotor. This is what it looks like when both pads are correctly installed against the brake rotor. Make sure the pads move freely within the bracket with no access play. The caliper is now ready to be reinstalled. (Note: The pad with the sensor is usually in the inboard position). Reinstall the Brake Caliper: While holding the caliper slides inward gently set the caliper over the brake pads. If you have difficulty getting the caliper in place double check to make sure the piston is fully retracted into the caliper and the slides are pushed into the mounting bracket. Double check the piston position with a large C clamp or channel locks and push the piston inward. Once the caliper is successfully over the pads and slides install both mounting bolts by hand one at a time. Then tighten the bolts to manufacturers torque specification which is usually 35 to 45 foot pounds. Some slides have a hex where a wrench can be used to hold the slides from turning while tightening the bolt. Now completed repeat this brake job procedure for the opposite side of the car. 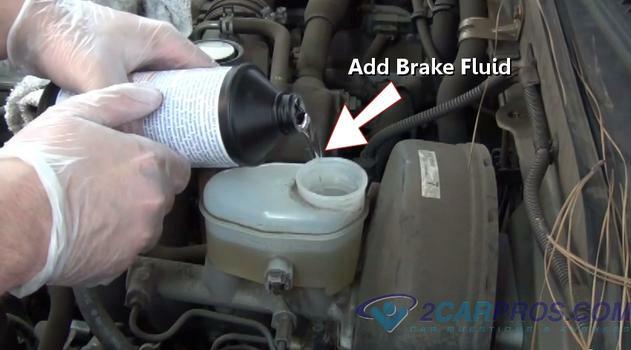 Adding Brake Fluid: Open the hood and locate the brake master cylinder which is usually on the driver's side near the firewall. Use a shop towel and clean the brake master cylinder reservoir and lid to ensure no dirt falls into the fluid then remove the lid so fluid can be added. Add brake fluid from a sealed container until the level meets the "FULL" line on the reservoir. Once the fluid has been installed to its proper level reinstall the lid and wipe an excess brake fluid with a shop towel. After the brake pedal has been pushed down and proper brake pressure has been obtained recheck the fluid level and re-add if needed. Push Down On the Brake Pedal Slowly: Once the opposing side is complete double check your work to make sure all bolts are on and tight. Slowly push the brake pedal downward, the pedal will go to the floor. Then allow it back up very slowly, never pump the brakes quickly. 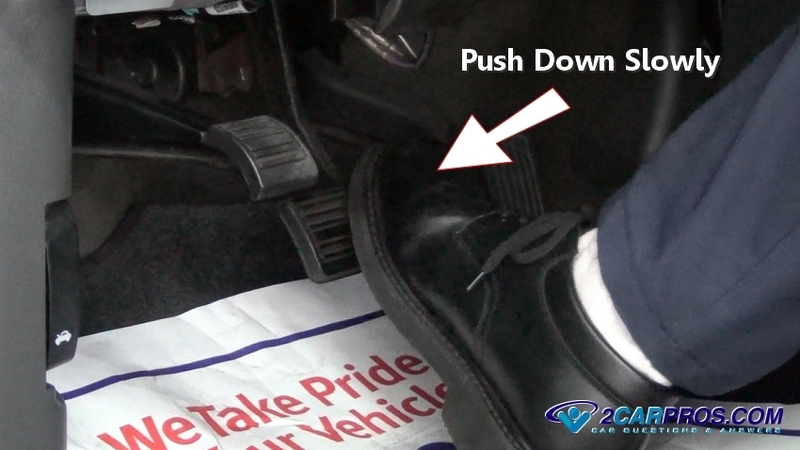 Repeat this operation until you feel the brake pedal become normal and have pressure. This can take four to seven cycles. This operation is forcing the brake pads to travel to the brake rotors while taking up the air gap between the pad, rotor and caliper piston. Do this until normal brake operation has returned (brake pedal is in its normal position). Moving the pedal slowly helps prevent air bubbles being trapped in the system which alleviates bleeding. If the pedal seems spongy air is trapped and the brake system needs bleeding. 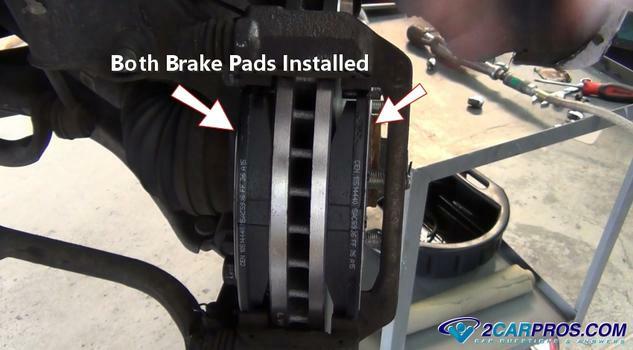 Breaking In the Brake pads and rotors: After a brake service has been performed and the car is safety on level ground recheck the brake pedal operation. This should be done with the car running and in park to aid the power brake system. When first using the new brakes they will not work as good because they have not been broken in yet this means the pads have not mated to the rotor. To do this properly take the car for a test drive use the brakes gently while doing easy stops. Then releasing the pedal monetarily and then reapply it while stopping. This will break in the pads while allowing them to cool and release any brake material disbursed in the process. Repeat this procedure 5 to 7 times at this point the brakes are ready for the open road and the brake pedal operation should be normal. If you hear any strange noises or the pedal is soft or spongy recheck the job by re-jacking the car up and removing the wheels of inspection or re-bleeding the system. Never continue to drive a car without normal brake pedal operation. If you have any questions brakes please visit our forum. If you need car repair advice please ask our community of mechanics is happy to help and always 100% free.